A total of 45 delegates attended the two day workshop. Four facilitators were present on each day (one from Kheth Impilo and three from the Africa Centre). There was also an events coordinator in attendance to cover delegate registration and administration. Participants were all from KwaZulu- Natal (KZN) province from the three districts that Kheth?Impilo supports. Medical doctors (31%) and professional nurses (26.6% + 17.7%) accounted for the majority of participants, together making up a total of 75% of delegates. 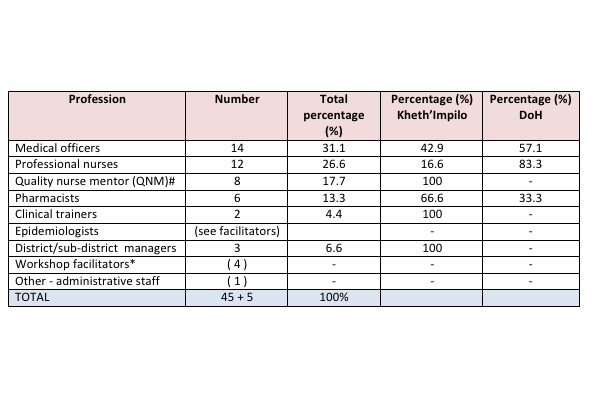 #Quality Nurse Mentors (QNMs) are a cadre of staff created by Kheth?Impilo to support staff on-site to ensure that all healthcare workers provide quality care. They are all professional nurses by profession. Theory and fundamental concepts relating HIV replication, anti-retroviral drugs and drug failure (128 Power Point slides) based upon the recent publication 'HIV & TB Drug Resistance & Clinical Management Case Book' by T Rossouw, R J Lessells & T de Oliveira. A presentation on Day 1 by Dr. Kevi K Naidoo included an overview of the model of care of patients in the primary health clinics (PHCs) and the management of drug resistance. - Dr. Turesha Chetty covered a case study on ARV failure in a pregnant woman exposed to sdNVP. Risks associated with PMTCT drug exposure were highlighted. All sessions remained interactive to give participants opportunities to ask questions, obtain clarity on concepts and share clinical experiences with the audience. Participants were encouraged to bring cases relating to patients failing treatment from their clinics for discussions.